You have probably read about the dire plight of the honeybee, a species introduced here from Europe in colonial times. Honeybees are succumbing in large numbers to a mysterious complex of ills called “Colony Collapse Disorder”. But perhaps you have not given much thought to our native bees that may be even more essential for most of our pollination needs. The United States Department of Agriculture reports that there are approximately 4,000 species of bees native to North America. These bees do a much better job at pollinating some plants than do honeybees. Native bees are especially effective at pollinating tomatoes, eggplants, pumpkins and other squashes, cherries, blueberries and cranberries. They also pollinate 80% of our flowering plants, trees, shrubs and wildflowers. Azaleas, for instance cannot be pollinated by honeybees, because of their long calyx. 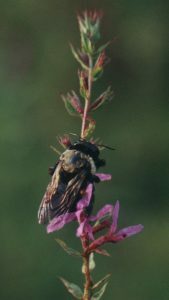 Native bumblebees pollinate azaleas by using an ingenious method called buzz pollination. They clasp the blossom and vibrate their abdomen to shake loose the pollen. Bees also use buzz pollination on tomato and blueberry flowers. Bees eat both pollen and nectar. Our native bees may either be colonial nesters (bumblebees) or solitary nesters (most other types). They may nest in holes in wood or underground. One type of native bee, the cuckoo bee, is even a parasitic nester, laying its eggs in another bees nest. There are fifty species of bumblebees native to North America. Underground nests of the bumblebee species may be as long as a foot long with several nesting chambers branching off the main tunnel. Native bees come in all sizes and colors. Sweat bees are metallic green and blue or copper or gold. The tiny blue orchard bee pollinates fruit trees. Yellow-masked bees are black and yellow and resemble wasps. All bees, unlike wasps, have at least a little hair on them, and have two fused pairs of wings. Wasps have only one pair of wings. The honeybees’ plight seems to be caused by a combination of disease, nutrition and pesticides. Our native bees, being mostly non-colonial nesters are a bit less affected by disease. But, native bees are also declining, and that decline seems to be related to habitat loss and pesticide and herbicide use. Here are some things we can all do to encourage our pollinators. First, we can plant a pollinator garden. To avoid pesticides, adopt non-chemical solutions to insect problems. You can control aphids, for instance, by spraying them with water from a hose. In your yard, you should provide a source of water and a little bare ground and mud for nest building. Reduce the size of your lawn by planting a native plant garden from your eco-region. Mowing your lawn every other week is a good way to provide the clover, plantago and veronicas that bees thrive on. Standing dead trees also provide homes for many bees and birds. A fun project to do with kids is to make a bee-nesting house out of hollow twigs or reeds bunched together and packed into a container such as a small milk carton. The nesting twigs will be closed at one end and hung horizontal to the ground facing south. Bees will come into it to lay one or more eggs that they then seal up with mud. If you are lucky you may see the juvenile bees hatching in a few days. New England Wildflower Society website is a good source of information. Go to their website www.newenglandwild.org. As part of their new “Pollinate New England” effort, NEWFS is offering a free online pollinator garden course this spring and summer. You can take this course on your own computer and at your own speed. They are also offering free hands-on pollinator gardening workshops at various locations in New England. One of these is offered on June 26 in Wellesley, MA. You can buy native plants at The Garden in the Woods in Framingham, and at some other nurseries. For more information on how to help pollinators, go to the Pollinator Partnership website at www.pollinator.org. At that site you can see all the Pollinator Partner gardens in the country and register your own pollinator-friendly garden. Many thanks to all the flora and fauna reporters for the month of April. Please send reports by May 26 for next month’s column. You can call me at 692-3907, write me at 7A Old Colony Drive, Westford, or e-mail me at MarianCHarman@verizon.net. Dot Mooney, Monadnock Drive. March 3, ten juncos, two house sparrows on deck, a downy woodpecker on the suet. Debbie Prato, Hayrick Lane. March 27, eight deer. Marian/Bill Harman, Old Colony Drive. March 28, grackles have arrived. March 30, three pairs of common mergansers on the pond. Wood frogs are going strong in the Main St. vernal pool. Doug Pederson, at Forge Pond. March 29, seven red-tailed hawks soaring and circling together, a few grackles in the tall tree in the middle of the pond and several red-winged blackbirds. A beaver was making his trip across the pond and didn’t notice being photographed. Brian Day, Coldspring Rd. March 29, heard peepers at night. Rosemarie Koester, Providence Rd. Heard peepers last night for first time–happy to hear them. Two geese making a racket. Marian/Bill Harman, Old Colony Drive. April 1, five common mergansers, four females and one male, resting on the pond. cardinal, white-breasted nuthatch, eight goldfinches, blue jay, red-bellied woodpecker, titmouse, four juncos. April 5, blue jay with a new call, sounding like a loud woodpecker, red-winged blackbird. April 7, song sparrow, mourning dove. At Chamberlain Rd, red-tailed hawk, two barred owls calling, wild turkeys, three crows, a pair of pileated woodpeckers. April 9, grey squirrel eating a downy woodpecker that had hit our slider window. Squirrel quickly ate the whole thing, leaving only a few feathers. Male cardinal feeding a female. April 9, four juncos, red-winged blackbirds, three mallards, first phoebe heard here, house finch. April 14, hail storm. Juncos, cardinals nuthatches, goldfinches, grackles, mourning dove, heard peepers and wood frogs in a vernal pool we have discovered on the Pilgrim Village common land. April 17, three juncos. April 23, a few juncos still here. Diane Duane, at Boston Rd. April 4, saw our first great blue heron of the season at around 11:40 a .m. flying south over Minot’s corner. Debbie Prato, Hayrick Lane. April 4, Canada geese, mallards, skunk, raccoon. April 5, robin, black duck. April 9, mockingbird and bluebird fighting over suet. April 22, fifty robins on Audubon field. April 12, flicker. April 18, only two juncos still around. April 21, five fish crows. April 24, white-throated sparrows, house finches. Vanessa Banyas, Main St. April 6, two pileated woodpeckers seen at Chamberlain Rd. Elaine D’Alessandro, at Stone Arch Bridge. Mallard pairs seen on Stony Brook. Emily Teller, Texas Rd. April 8, first phoebe heard. Dave Coleman, Chestnut Rd. April 13, ‘Possums seem to enjoy getting up on my deck and looking at me through the patio door. I frequently see a red fox jogging up and down the road early in the morning. Beautiful animal, and I imagine there is a den nearby. Usual cast of characters in the bird world this winter at the feeder. Ginger Dries, Sherwood Dr. April 18, beautiful fox trotting by. Robins, goldfinches, chickadees checking out birdhouse, cardinals, a cowbird, jays, doves, titmice, nuthatches, red-bellied woodpecker, lots of sparrows, groundhog, grey and red squirrels, rabbits. April 25, juncos are gone. Mark Champion, West St. April 21, we spotted a black bear in our back yard after we noticed the motion-sensing light was on. We’ve been seeing bears, or evidence of them, here for the past few years [Mark sent a good trail camera photo–MH]. Doug Pederson, Woodland Drive. April 22, saw a robin and a pair of house finches today–good sign! Rosemarie Koester, Providence Rd. April 26, nuthatch, chickadee, house finch, many goldfinches, pair of cardinals, four blue jays, red-winged blackbirds, cowbird, hawks, sparrows, ducks and geese in nearby marsh. A leucistic dove–partially white, seen with a partner. Last junco seen on April 10. Mother deer and young one, turkeys, busy squirrels, chipmunks, periwinkle blooming, hyacinths blooming.